Missile Defense Thrity Years Ago: Deja Vu All Over Again? Washington, D.C., January 12, 2001 – International Security has just published, in its Winter 2000/2001 issue, an article, "Whether To 'Strangle the Baby in the Cradle'": The United States and the Chinese Nuclear Program, 1960-64," written by National Security Archive analysts William Burr and Jeffrey T. Richelson. Drawing on recently declassified documents, the authors provide the first detailed account of the Kennedy and Johnson administration's reactions to the emerging nuclear weapons capabilities of the People's Republic of China (PRC). Besides elucidating the systematic efforts by the intelligence agencies to monitor Chinese nuclear weapons developments, the authors describe and discuss the concerns of U.S. senior officials and expert advisers over the prospects of a nuclear-armed People's Republic of China (PRC). The authors also review the possible courses of action, including covert military operations, that top officials, including President Kennedy, considered in response to the Chinese nuclear program. Many of the documents that follow are cited as sources in the International Security article; others were selected because of their interest. Most are published here for the first time. Source: Library of Congress, Thomas White Papers, box 44, Air Staff Actions. This document suggests the foreboding with which senior Air Force officers viewed the possibility of a nuclear-armed China. It also illustrates Air Force intelligence's predisposition to make exaggerated forecasts of adversary capabilities. A recent CIA estimate, National Intelligence Estimate 13-60, issued in December 19601, had predicted that Beijing could test a nuclear device during 1963, but Air Force estimators suggested that a test could be much earlier: it "may occur in late 1961." To neutralize a Chinese nuclear capability, Air Force planners went far in advocating nuclear weapons dispersal to U.S. allies and other potential cooperators in the region, including India. Not long after Beijing actually tested a device in October 1964, the possibility of U.S. nuclear support for South Asian countries attracted interest in the Pentagon and in some quarters of the State Department, but it was out of step with the Johnson administration's developing interest in nuclear nonproliferation. As this document indicates, NIE 13-60 had a significant impact on the national security bureaucracy beyond the Air Force. For China watchers at the State Department, CIA's analysis that it was not a matter of "whether" but "when" Beijing would test a nuclear weapon was highly significant not least because it meant that government officials would have to begin thinking about the broader implications of a Chinese nuclear capability. If CIA prepared an NIE on Chinese nuclear weapons during 1961, it remains to be declassified. This estimate shows the considerable progress that the Agency had made in using sophisticated collection methods--satellite photography and U-2 flights by Chinese Nationalist pilots--in expanding its database on Chinese nuclear developments. Nevertheless, much remained elusive to U.s. intelligence; for example, CIA had yet to learn that the installation at Lanzhou was in fact a gaseous diffusion plant that would soon be ready for operations. The Kennedy administration's recognition that China would test a nuclear weapon prompted State Department officials to initiate an overt and covert public information program designed to influence world, especially Asian, thinking about the significance of a Chinese nuclear capability. Worried that in the worst case, a Chinese test could spark an "acute concern accompanied by a drive to seek an accommodation with Peiping" and a corresponding loss of U.S. influence, State Department planners wanted to find ways to neutralize any apprehension that an early Chinese nuclear capability could inspire. Toward that end, Undersecretary McGhee circulated a detailed outline--approved by Secretary of State Rusk a few days earlier--of an information program to be carried out by U.S. government agencies, including the U.S. Information Agency, the State Department, and the Central Intelligence Agency. The latter would prepare "propaganda guidance" that could be used for "replay in unattributed media." In other words, CIA officers would prepare articles that could be published in overseas newspapers without attribution to U.S. sources. Source: Library of Congress, W. Averell Harriman Papers, file "Kennedy, John-General 1963"
On 22 January 1963, President Kennedy presided over a National Security Council meeting where he shared, with top advisers, some of his thinking on current foreign policy problems. W. Averell Harriman, a foreign policy veteran whose experience dated back to Franklin D. Roosevelt administration, quickly provided the president with his reactions on a variety of international issues. Kennedy undoubtedly saw through the flattering remarks that prefaced Harriman's letter but there was no question that the president and his adviser were both uneasy about the prospects of a nuclear-armed China. In a theme that would become prominent during 1963 and 1964, Harriman believed that cooperation with Moscow could provide a possible avenue to "compel China to stop nuclear development." What could provide the underpinnings of an anti-Chinese alliance, Harriman suggested, was mutual concern, not only with the Chinese problem but also with the importance of avoiding a nuclear-armed Germany. A few weeks after Harriman's letter to Kennedy, Assistant Secretary of Defense for International Security Affairs Paul H. Nitze requested the Joint Chiefs of Staff to prepare a study on what could be done to "persuade or compel" China to accept a test ban treaty. Within a few months, the Chiefs had prepared a fairly detailed study of the requisite steps, all the way from diplomatic pressure to nuclear attacks on Chinese weapons facilities. Like Harriman, the Chiefs concluded that the "best means" to secure Chinese acquiescence in a test ban system lay in "joint US/Soviet measures." The Chiefs, however, did not comprehend the depth of the Sino-Soviet split because they believed that Moscow was in a better position than Washington to influence Beijing. More realistically, they recognized that there was "no guarantee" that "overt military force" or any other method could secure Chinese cooperation on a test ban. The possibility of U.S.-Soviet cooperation against China animated part of a conversation between national security assistant McGeorge Bundy and Soviet ambassador Anatoly Dobrynin. But while Bundy wanted to have a "private and serious exchange of views" on China, Dobrynin wanted no part of it not the least because of Soviet objections to U.S. nuclear sharing arrangements under the proposed Multilateral Force. This was Averell Harriman's copy of a top secret Arms Control and Disarmament Agency (ACDA) report that was prepared for his use during the test ban negotiations in Moscow during July 1963. Full of significant detail, including reproductions of reconnaissance photography and comparative data on the status of the French and the Israeli nuclear programs, it confirms the importance of Taiwanese covert U-2 flights in producing photography of Chinese nuclear facilities. It also reflects the inaccurate state of the intelligence community's knowledge about the progress of the Chinese nuclear program, particularly the degree of headway made in constructing a gaseous diffusion facility. In September 1963, Director of Central Intelligence John McCone sponsored an official visit to Washington by General Chiang Ching-kuo, Chiang Kai-shek's son and the feared chief of Taiwanese intelligence. While in Washington, Chiang had meetings with CIA officials, President Kennedy, and McGeorge Bundy. Among those present at the meeting with Bundy were CIA Deputy Director of Intelligence Ray Cline (former chief of station in Taiwan), current station chief William Nelson, and CIA deputy desk chief for Taiwan James D. Duffey (whether Duffey worked at the Directorate of Intelligence or the Directorate of Plans is unknown). Chiang brought to the meeting his father's long-standing interest in getting U.S. backing for military operations against the Communist regime. Although wanting to weaken the PRC, Bundy was also averse to provoking a "major conflict" and had no interest in sponsoring an invasion that could possibly bring Moscow and Beijing back together. Bundy did, however, pursue the Chinese nuclear problem with greater intensity; the two easily reached agreement on the desirability of further discussions on "ways and means of delaying the development of nuclear growth on the Chinese mainland." During the fall of 1963 Policy Planning Council staffer Robert Johnson established himself as the national security bureaucracy's chief analyst on the Chinese nuclear problem. Although President Kennedy and his advisers had given momentum to thinking about using force against Chinese nuclear facilities, Johnson tried to push official thinking in another direction: to consider the possibility that for a variety of reasons, a nuclear China would not be as ominous or act as recklessly as some had feared. This document represents the distillation of several long studies prepared that Johnson had prepared during the course of 1963. During the months that followed, he would continue to work on the China nuclear problem and play significant role in shaping the way that top officials thought about it. This memorandum shows that the thinking to which President Kennedy had given momentum, the need for forceful action, against the Chinese nuclear program, had continued in the realm of covert planning. Perhaps unaware of the 29 April JCS study (see document 6, above) which was prepared before he became chairman, Taylor exaggerated when he stated that "no one has written ... on how we can prevent or delay the Chinese from succeeding." Nevertheless, this may have been the first detailed covert action study on this problem. Unfortunately, the study itself is unavailable and it remains to be seen whether a copy even survived in JCS files. This memo, attached to the evening reading provided by Secretary of State Dean Rusk, summarized Robert Johnson's far more extensive study on the implications of a PRC nuclear capability. The summary provides brief conclusions with regard to the military as well as political-psychological effects of a Chinese nuclear test. In exploring possible U.S. counteractions, it states that military against Chinese nuclear facilities would be undesirable, except possibly as part of a general response to major PRC aggression. It also offers suggestions with regard to lowering the likelihood that other nations would develop nuclear capabilities. This document summarizes the central arguments of a still-classified study on "An Exploration of the Possible Bases for Action Against the Chinese Communist Nuclear Facilities." that Robert Johnson conpleted in mid-April 1964.2 The first part of this document considers reducing the likelihood of nuclear proliferation via direct action against Communist Chinese nuclear facilities. It is noted that elimination of China's nuclear capability would greatly reduce the immediate incentive for Indian nuclear weapons development and possible subsequent movement by Japan to acquire such a capability. The United States, however, could not be sure that its action would fully eliminate China's capability and, in any case, China, could reconstruct its facilities. The first section also considers the possibility of international agreement, action in response to PRC aggression, and covert action. The second part of this document examines, inter alia, alternatives such as broad U.S.-Soviet defense guarantees, guarantees applicable only to India, and an Asian nuclear-free zone. This cable, sent to U.S. Embassies throughout Asia, requested information to help shape the U.S. campaign to minimize the psychological effect of a Chinese Communist nuclear detonation. The information sought concerned awareness of a possible Chinese nuclear test, attitudes of local officials and informed individuals, and whether any additional material was needed by the embassies to implement the program. It includes revealing statements by top Chinese officials, including Mao Zedong (at his earthiest), Premier Zhou En-lai, and Foreign Minister Chen Yi spelling out why they believed that it was important for the PRC to have a nuclear weapons capability. Prepared against the background of a possibly imminent Chinese nuclear text, Robert Johnson again considers both pre-emptive action and alternative responses to the PRC's nuclear weapons program. It notes "very and long-lasting political costs" associated with a pre-emptive strike. It also explores options, in the absence of pre-emptive action, for reducing the likelihood of proliferation as well as the potentially adverse political-psychological impact of a Chinese test on its neighbors. In addition, it addresses the impact on U.S. military posture of the gradual development of a Chinese nuclear capability and considers the prospects of joint U.S.-Soviet action to deal with a Chinese capability. In his press conference of September 29, 1964, the State Department's spokesman followed up a CBS report of a forthcoming Chinese nuclear test. He noted that the "United States has fully anticipated the possibility of Peiping's entry into the nuclear weapons field and has taken it into full account in determining our military posture." One question focused on whether the U.S. was prepared to address the possible psychological impact in Southeast Asia of a Chinese detonation. The spokesman noted that a detonation would not affect U.S. ability or willingness to help Asian nations "defend themselves against Communist aggression." Seaborg reports on a National Security Council meeting he attended on October 17, 1964--three days after China first detonated a nuclear device. Seaborg's entry describes the information provided to the group by Director of Central Intelligence John McCone, concerning the Chinese nuclear program as well as the removal of former Soviet Premier Nikita Khrushchev from power. Seaborg also reports President Johnson's questioning of Carl Rowan, head of the U.S. Information Agency, on world-reaction to the Chinese test, along with Rowan's response. Johnson observed that it was important to remain calm, avoid panic, and make clear to the American people that the administration was alert to the situation. These Seaborg diary entries report on a Cabinet meeting and a conversation with DCI John McCone respectively. At the Cabinet meeting, Seaborg reported that, "to our surprise," the Chinese device apparently contained uranium-235, rather than plutonium. U.S. intelligence analysts had believed that the basis for the first Chinese bomb would be plutonium. In his telephone conversation with McCone, Seaborg reported the conclusion that China's bomb was based on U-235. McCone said that he would explore the possible source of the uranium--whether it came from the Soviet Union or an indigenous Chinese facility. This cable reports on a briefing given to President Chiang Kai-Shek, president of the Republic of China, by CIA Deputy Director for Intelligence Ray Cline, and the subsequent discussion. 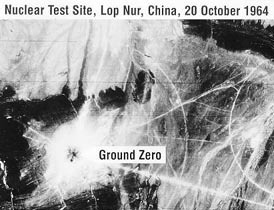 The briefing and discussion took place ten days after the PRC first detonated a nuclear device. Subsequent to the briefing Chiang gave a very pessimistic account of the impact of the PRC test. He characterized Asians as being "disturbed and scared." "No amount of talk or explanation," Chiang claimed could neutralize the psychological impact of the test. He also challenged the U.S. to provide his government with the means to destroy PRC nuclear installations. The cable, however, characterized the Cline briefing as being "highly successful in strengthening GRC [Government of the Republic of China] confidence in US [deleted]." Document 21: George G. Rathjens, Arms Control and Disarmament Agency, Destruction of Chinese Nuclear Weapons Capabilities, December 14, 1964. This internal Policy Planning Council memo examines the implications of the future commissioning of a PRC missile-launching submarine, apparently similar in design and capabilities to the Soviet Golf submarines. Those submarines could carry three ballistic missiles with 350 nautical mile range and operate out to 4850 nautical miles. The memo explores the U.S. ability to monitor the movements of such a submarine, the political and military impact of operational Chinese "G"-class submarines (including catalytic war), and possible U.S. response such as blowing the submarine out of the water. Naval intelligence's apprehension about PRC submarine-launched missiles was premature because China did not have such a capability until the 1980s. 1. Published in full in U.S. Department of State, Foreign Relations of the United States [FRUS] 1958-60 XIX (Washington, D.C., Government Printing Office, 1996), 744-47. 2. For the sanitized text as it appears in the FRUS, see document number 25 at <www.state.gov/www/about_state/history/vol_xxx/21_26.html>. 3. Owing to the Archive's successful appeal to the Interagency Classification Appeals Panel, this is a fuller version of the document than appears in the FRUS, see document number 49 at <www.state.gov/www/about_state/history/vol_xxx/41_49.html>. 4. See document number 54 at <www.state.gov/www/about_state/history/vol_xxx/50_59.html>. 5. Shane Maddock, Nuclear Apartheid: The Quest for American Atomic Supremacy from World War II to thePresent (Chapel Hill: University of North Carolina Press, 2010), 241-242.